Dębica is located 25 km south of Kołobrzeg. The airfield was located 3 km southeast of Dębica. 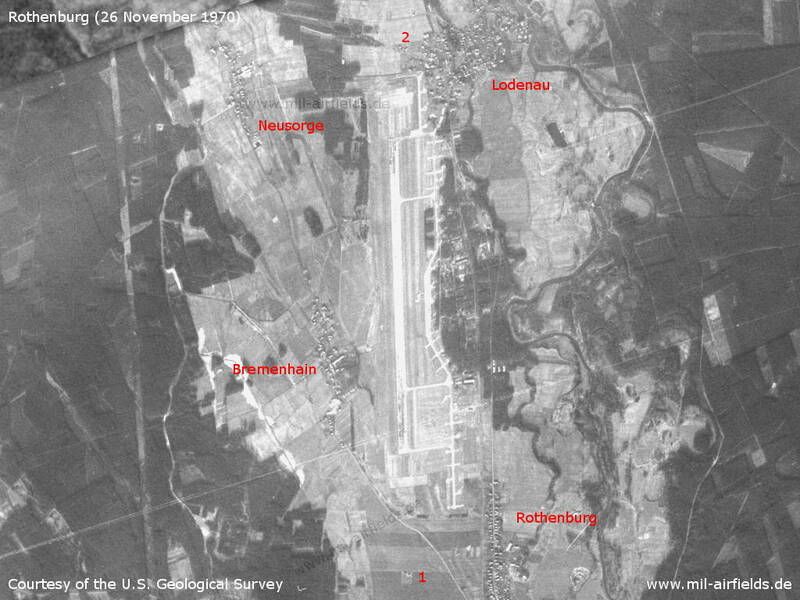 Dębica Airfield on a US satellite image from 03 August 1969 - 1: airfield; 2: probably radio beacons in this area. Other places: Kalina, Leszczyn, Mirowo, Nowe Ślepce, Poradz, Słowenkowo. At the southeastern beginning, the runway seems to be paved. LOM: 605 "LJ / SG"
LMM: 295 "L / S"
Area: 730 ha (Source: www.bicc.de). Closed. Transfered to Polish Authorities on 19APR1991 (Source: www.bicc.de).